Two teams of Neurophiles entered the competition with 12 runners for the 10km, and 12 for the 20km. Since the LN coordinator had a baby just before the race, there are no photos of the run on our website. For results and photos of the runners, please see the link here. The NEUROPHILES 10k team made it the 29th out of 56 teams, and the NEUROPHILES 20k made it 14th out of 28 teams. CONGRATULATIONS! 2016: A postcard from (unstable) heaven for as many LN runners as never before. Twenty-eight (!) runners made up 4 teams of NEUROPHILES in 2016 and resisted the cold (all day), started their race in the sun (some), got caught in snow and hail (most) and finished their race in the sunshine (unfortunately only very few ...). Details on the heroic runners and results can be found under the link here. Thank you all for being there and resisting the unfavorable weather conditions! Started (nearly) in the sun, ended up soaking wet! The brave LN running teams stood up against not so nice weather conditions and succeeded as usual! Two NEUROPHILES teams ran the 10 km (team 1 & 3) and team 3 went for the 20km. As usual, the DNF activated all its resources, but the support from CHUV and the University of Geneva is on the rise! Stay tuned for next year's run! Details on runners and results can be found under the link here. 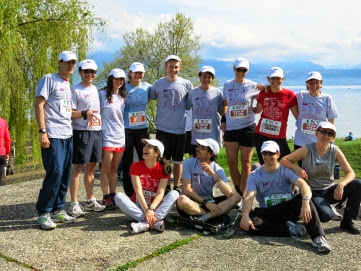 In 2014, three teams of "NEUROPHILES" comprising of members of the Lemanic Neuroscience program and collegues of the DNF and CNP of UNIL/CHUV started in the "20 km of Lausanne". This year, nearly 20'000 runners were present at the event overall! In the 10km race, team NEUROPHILE 3 finished in position 64 and team NEUROPHILE 1 in position 73 (out of 89 teams). In the 20km race, the team NEUROPHILE 2 finished in position 26 (out of 39). Congratulations to all runners and thank you for again making the Lemanic Neuroscience program so visible !!! Please click on the link to runners' details. This year, 2013, we organized for the second time teams to represent the Lemanic Neuroscience program in the 20 Km of Lausanne, a popular race with more than 18'000 runners in all different categories. We had eight runners for the 10 Km and six for the 20 Km in Lausanne. The race took place on Saturday April 27th under a cold and persistent rain. Some of us improved our times from last year (... one year older, 1 minute faster!! ), and many did an excellent race, running faster than they had expected. Result and runner details can be found here. The LN team for the 10 Km ended in position 39th out of 86 teams, and we were 18th out of 32 for the 20 Km team. Congratulations to all runners and thanks for contributing to the visibility of the Lemanic Neuroscience program!! 10th out of 31 teams for the 20 Km, and 43rd out of 88 teams for the 10 Km. Result details can be found here. According to Nicolas Toni, we ran a total of 240km, which amounts 16’000 calories and the equivalent of 2 kg of body fat. We can thus claim that on that glorious day of April we lost 2kg of Neuroscientists!! Thanks to all for contributing like this to the visibility of the LN program! Jean-Pierre Hornung, co-director of the LN school, runs more than any of us, up and down Lausanne, to take pictures. Click below to see photos taken by him and other team supporters!